We're still on the Smokies! And will probably be so for the next couple of posts. While having some coffee and tea at the Tribal Grounds Coffee Shop in Cherokee, NC, during our Easter Week vacation, my wife came across a local publication. It covered activities throughout the area and all the way over to Waynesville, which is about a 30-mile drive to the east. I don't remember the name of the rag, but I do remember what it led to. Wifey saw an article about an art show at Gallery 86, a downtown location. The show was sponsored by the Haywood County Arts Council. I had told her previously that this was a leisurely trip and if there was anything she wanted to do, I would try to accommodate her. Well, I didn't read the article about the event, but she decided that we would go over and peruse the offerings. Local artisans had their work on the walls of the studio. Wifey and I walked around and around seeing if we liked anything. Well, there was this one piece of art called "Butterfly Candy" that she fell in love with. 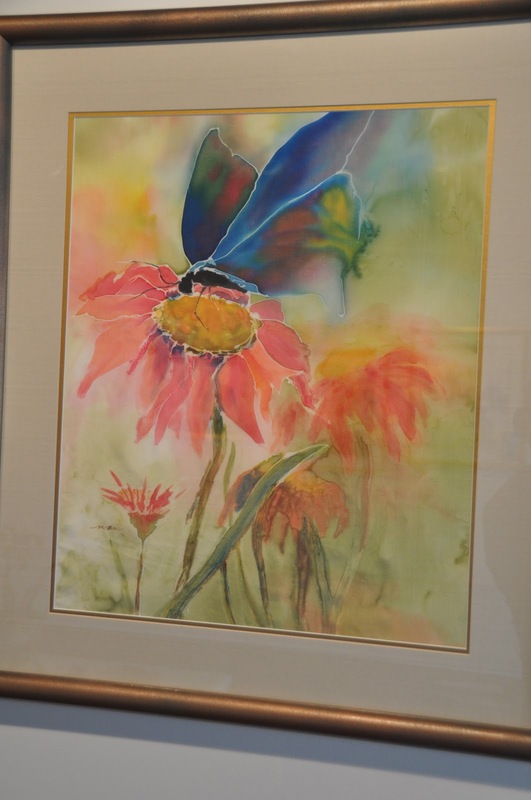 The artist was Nancy Howell Blevins. Wifey Linda wanted to buy it. I then recalled an earlier time numerous decades ago in San Francisco when we visited an art gallery somewhere near Fisherman's Wharf. I fell in love with a painting of San Francisco. We visited the studio a number of times getting up the courage to purchase the offering. Of course the artist took some liberty with his interpretation, but I just loved the picture and although at the time we felt it cost a lot of money ($175), wifey was on board with the purchase. How could I not return the favor? I later found out that "Butteryfly Candy" was the featured picture in the newspaper with the story about the showing. It (the purchase) was actually a done deal before we even left Cherokee. Wifey just didn't let me in on it. Fortunately the artwork was available when we arrived. This is a beautiful painting. So is it the one you bought?